MuscleBlaze Bulk Gainer 2.2 lb Chocolate with DigeZyme is a high-calorie gainer for bodybuilders and gym enthusiasts. 2 servings of MuscleBlaze Bulk Gainer helps to provide 1123 additional calories over well-balanced meals in a nutrition-rich package. The daily allowance of 54g proteins and 214g carbohydrates in the ratio of 1:4 ensures that the bodybuilders is never low on energy and has ample amino acids readily available to trigger new muscle synthesis. 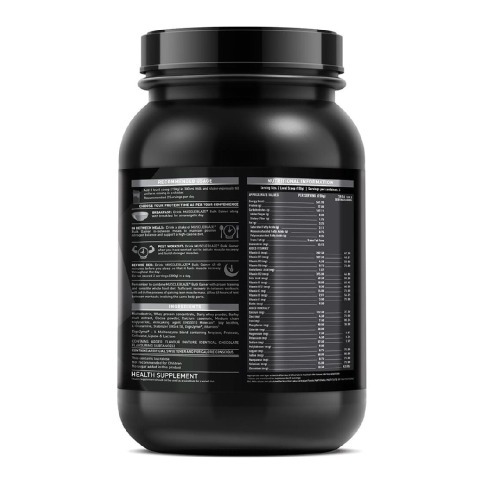 MuscleBlaze Bulk Gainer Chocolate comes with 27 vitamins and minerals, which help to fill in the dietary micronutrient deficiencies and build energy and immunity in the bodybuilders so that you could push harder through the last reps and are able to recover quickly post a rigorous workout session. The tempting rich chocolate flavour makes MuscleBlaze Bulk Gainer 2.2 a mouth-watering treat and a well-deserved reward for the hard work at the gym. The presence of digestive enzymes improves protein and carb digestion and reduces unpleasant episodes of bloating. 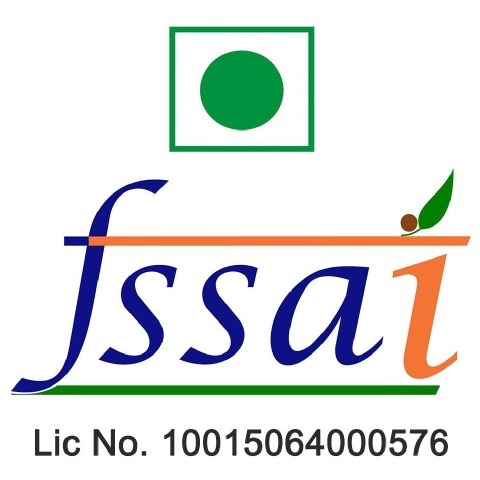 Maltodextrin, Whey Protein Concentrate, Dairy whey powder, Barley malt extract, Cocoa Powder, Calcium Caseinate, Milk Protein Isolate, Medium chain triglyceride powder, Minerals, Soy Lecithin, L-Glutamine, Stabilizer (INS 415), Digezyme, Vitamins. 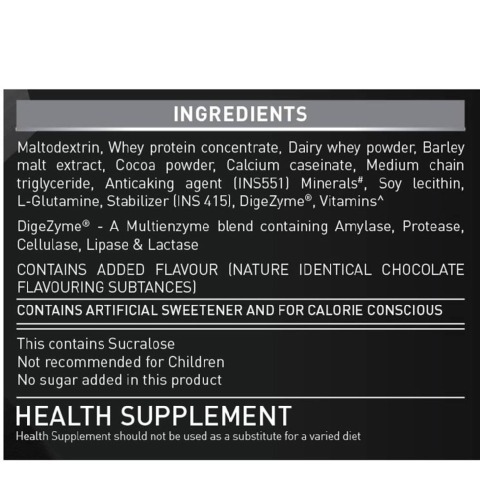 Mix two level scoops (150g) of MuscleBlaze Bulk Gainer 2.2 lb Chocolate in 200ml - 250ml water/milk. Blend for 45-60 seconds to get a thick and creamy shake. 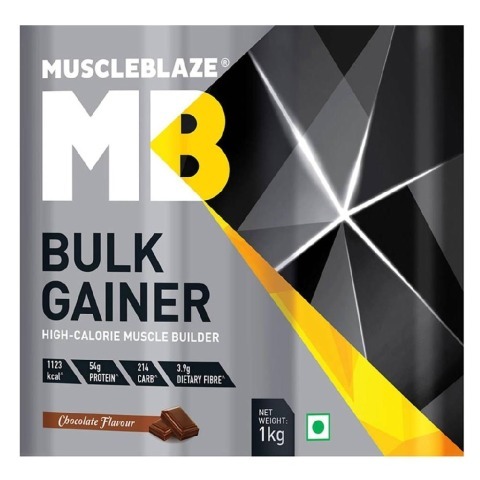 MuscleBlaze Bulk Gainer Chocolate is a substantial weight gain supplement, which will feed your need of serious calorie intake when taken as advised. Breakfast: Drink this Bulk Gainer along with breakfast for an energetic day. In-Between Meals: Drink a shake in-between meals to maintain positive nitrogen balance and support a high-calorie diet. Post Workout: Drink MuscleBlaze Bulk Gainer post your workout to initiate muscle recovery and build stronger muscles. Before Bed: Drink it 45-60 minutes before you sleep so that it fuels muscle recovery throughout the day. Do not exceed 2 servings (300g) in a day. Also, combine MuscleBlaze Bulk Gainer 2.2 lb with optimum training and sensible whole food diet. 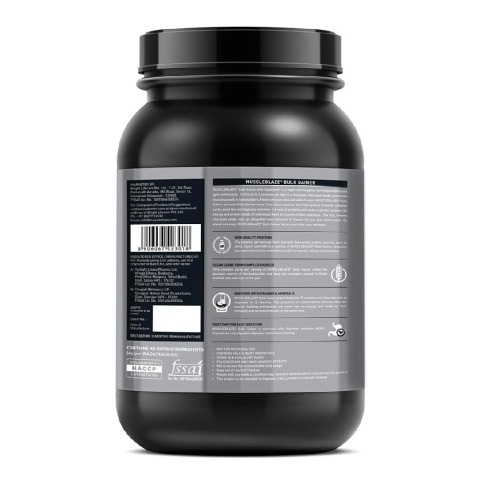 Sufficient recovery in-between workouts will help in the process of gaining lean muscle mass. Allow 48 hours of rest between workouts involving the same body parts. What is MuscleBlaze Bulk Gainer? 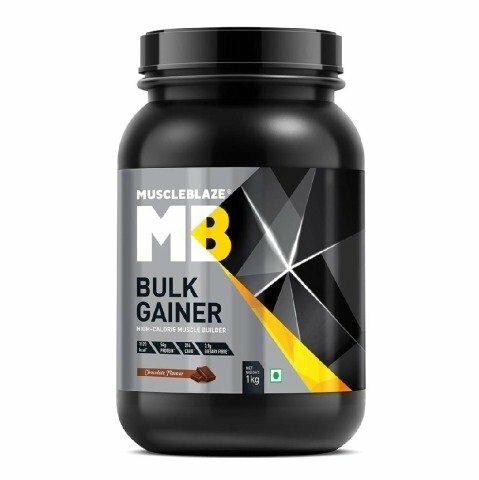 MuscleBlaze Bulk Gainer is a high-calorie gainer for fitness and gym enthusiasts. It is a proven way to build unadulterated muscle mass, if you work out and eat right along with it. 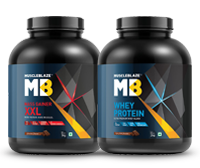 What benefits MuscleBlaze Bulk Gainer offers to the bodybuilders? 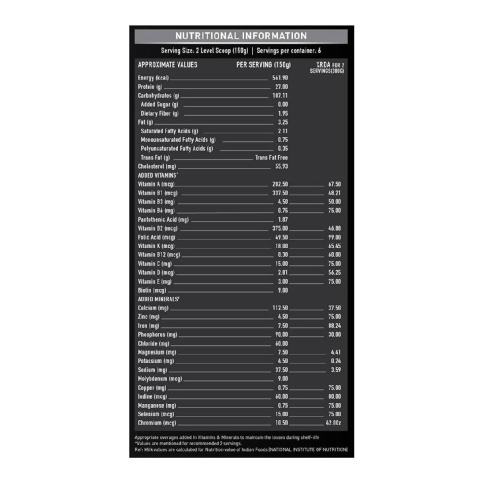 MuscleBlaze Bulk Gainer offers 1123 additional calories from quality nutrients, such as high-quality proteins and complex carbs. 1:4 ratio of proteins and carbs ensures a steady supply of amino acids and glycogen for building muscles and energy. 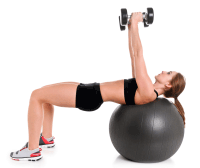 27 vitamins and minerals build energy and immunity in the gym enthusiast. It’s a well-known fact that intense workouts reduce your immunity. Additional energy from MuscleBlaze Bulk Gainer helps sustain longer workouts. The blend of digestive enzymes eliminates chances of bloating and improves the rate of protein digestion. What protein sources are used in MuscleBlaze Bulk Gainer? MuscleBlaze Bulk Gainer provides protein from four sources: whey protein concentrate, dairy, milk protein isolate and calcium caseinate. 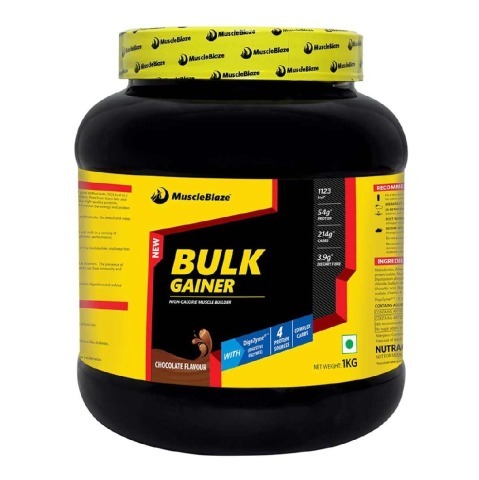 The blend of fast and slow acting proteins in MuscleBlaze Bulk Gainer ensure that amino acids keep trickling to the muscle tissues long after you have consumed MuscleBlaze Bulk Gainer. What kind of carbohydrate is used in MuscleBlaze Bulk Gainer and how does it help the muscle seeker? MuscleBlaze Bulk Gainer offers in a day 214g of complex carbohydrates in two servings. Carbs are especially useful in building energy, which is much needed to sustain heavy-duty exercise. Moreover, carbs in MuscleBlaze Bulk Gainer come from complex sources, which not only refuel the glycogen reserve of the bodybuilder but also provide sustained energy over a period of time. Why vitamins and minerals have been added in MuscleBlaze Bulk Gainer? MuscleBlaze Bulk Gainer has 27vitamins and minerals along with B vitamins. B vitamins have an important role to play in energy metabolism and their presence help ensure that our muscle building enthusiast is never low on energy. How to take MuscleBlaze Bulk Gainer? Mix two level scoops (a scoop is of 75g) in 300-350ml water or cold milk. Blend for 30-45 seconds and enjoy. The maximum serving size is 300g in a day, therefore, do not exceed the dosage to more than twice in a day. Will I get stomach upset after drinking MuscleBlaze Bulk Gainer? No, you are not going to feel stomach discomfort due to MuscleBlaze Bulk Gainer, as it is enriched with digestive enzymes, which improves the rate of protein digestion. 3.9g dietary fibre in a day in it also helps maintain healthy digestion.